At first glance, this equipment rental script features a clean and spacious layout hosting a default number of five listings per page. These appear with large images, a basic description, a rental price (either per hour, or per day) and a big, inviting button alongside each listing labelled, ‘Continue’. One of the first things you’ll notice is just how broad the selection of equipment listed here is. For example, on just the first page of the equipment rental script demo, we’re invited to hire a combo belt and disc sander, a 10-inch drill press, a snowboard, a bicycle helmet and a set of boys’ figure skates. This variety immediately reveals something of the thinking behind this equipment booking system… Stivasoft aren’t just looking to cater to one corner of the market, to tool hire or to commercial construction crews. Rather, they’re promoting this script as the basis for any kind of marketplace equipment hire. And why not? With an attractively sparse layout combined with a wealth of tools and functions, this is clearly a rental script with much potential. The booking process itself works like a dream. Click the ‘Continue’ button next to any one of the listings, and you’ll be taken straight through to a booking form for that item. Here the description appears in full, along with a selection of different images detailing the product. Users can specify a start date and time, as well as a convenient time for returns. Another button press confirms the time, checking availability of the product in question, and returning a quote for the hire period. One more button-press, and we’re through to the checkout of this equipment rental software. Here we can review the shopping basket, as well as a very logical breakdown of costs. And that’s it! All that’s left is to make an online payment, and specify a delivery address. From the user’s perspective, the process really couldn’t be simpler. The script seems to achieve exactly what it sets out to do, with the minimum of fuss… four button clicks will take you from a search of the equipment rental software, through booking calendars, images and item descriptions, all the way to a checkout screen. 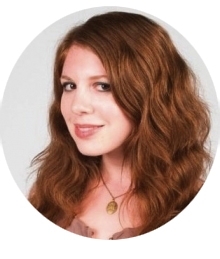 The admin area of Equipment Rental Script is somewhat more practical, and built for purpose. The design here is less image-driven that the customer area, but rather follows a logical system of menus and option screens. Webmasters are able to control virtually every feature of the way this rental marketplace appears – from item lists, images and descriptions through to calendars for marking availability, or monitoring exiting bookings. No coding knowledge is required, as you simply use the inbuilt features to customise text and images, ensuring that your items display beautifully on the page. Listings come with options for search engine optimization, as well as full mobile functionality… allowing your users to book equipment hire on the go! Different site users can be established and managed, in addition to providing categories, payment options and even support for multiple languages. 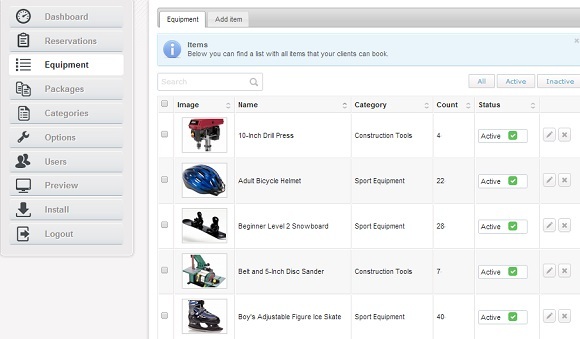 This equipment rental script allows for all available products to be organized into subject-related inventories, or organized for easy user searches by applying category tags. You’ll also have the option of providing equipment grouped into bundles – the perfect way to market items which will usually be used alongside each other. Once you’ve created listings for all your products and you’re ready to go, you’ll simply need to switch on the booking module and the online payment system of the equipment rental software – the latter allowing your users to send money via PayPal or Authorize.net, as well as bank transfers, credit and debit cards, or even making arrangements for cash on delivery. The equipment rental script takes care of the rest, with your catalogue instantly transformed into an intelligent and intuitive e-commerce platform. From here you just need to keep an eye on your calendar, watch out for notifications, and meet the rental demands as they come (hopefully) flooding in! You can pick up a copy of Equipment Hire Script from the PHPJabbers site, where it retails at a starting price of $59. The basic version of this equipment booking system comes with free installation support and free updates… but if you’re looking for a more advanced intro to the script, then a development version can be purchased for $159. This advanced package builds on the basic marketplace script by adding access to source code, copyright removal and multiple installations, as well as allowing for full custom modifications. This equipment rental script includes a range of useful features, including data base backups, automated invoices and access to a free installation wizard. It’s clean, functional and easy to use. You’ll be hiring out equipment in next to no time at all! It’s difficult to find fault with this intuitive equipment hire software… but one thing it could add, is the option for your users to log in using social media. Integrating accounts with social platforms would be a great way to earn further promotion for your hire shop. All in all, Equipment Rental Script from Stivasoft does exactly what you’d want it to do. The format is attractive, and easy to use – both from the front- and back-of-house perspectives. A range of handy customization tools will allow you to stamp your own brand onto the marketplace, while the simplicity of this software means that you’ll be up and running with your new hire script in a matter of minutes!